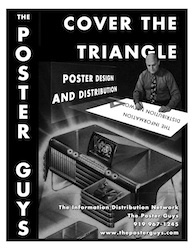 As any of our clients will tell you, the cheapest, fastest and most effective way	to get your message out to the public is with posters and flyers. 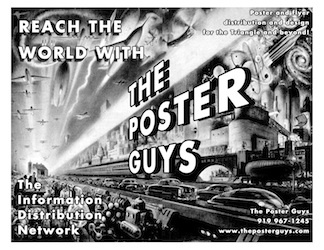 The best way to get them up and be assured that they stay up is by using us: The Information Distribution Network, aka "The PosterGuys". 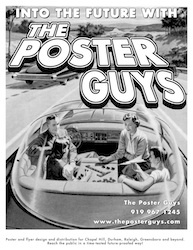 We will place your poster or flyer on Bulletin Boards in Chapel Hill, Raleigh, Durham, and on campuses all over North Carolina if necessary. 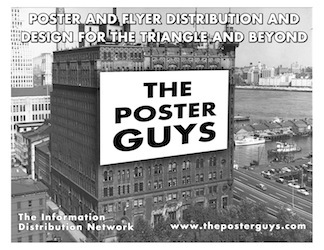 We are in touch with a nation of posterguys and can get your flyer posted on any college campus in America. We have over 30 years experience and know of thousands of locations that we can choose from to get you the best response. We also return weekly to the same boards and keep them in order and make sure your posters have not been covered up and we replace them on the boards that get cleared weekly. We are responsible, reliable, fast and efficient. on a US Postage Stamp! You can use Paypal to pay us. You will still need to send or bring us the posters but this is one way of paying for it. Please let us know which posters you are paying for when you make the payment. If Paypal does not give you that option and it is not obvious from your e-mail address please send us an e-mail and let me know what you just paid for.